WASHINGTON (AP) — Frustrated with the lack of action to overhaul the country's immigration system, tens of thousands of demonstrators rallied on the National Mall and marched through the streets of the capital Sunday, waving American flags and holding homemade signs in English and Spanish. 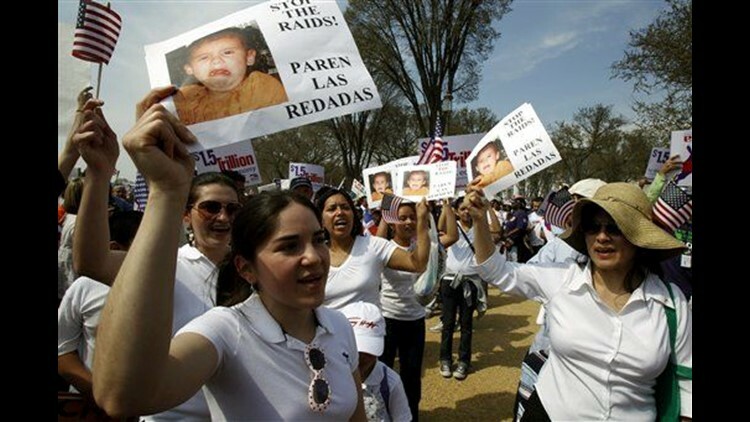 President Barack Obama, who promised to make overhauling the immigration system a top priority in his first year, sought to reassure those at the rally with a video message presented on giant screens at the National Mall. The president said he was committed to working with Congress this year on a comprehensive bill to fix a "broken immigration system." Some demonstrators were disappointed there hasn't been more action a year into Obama's term. "I understand it may not all be his (Obama's) fault," said Manuel Bettran, a 21-year-old college student from Chicago. "I am frustrated. I really wish not just him, but everybody, would take it more seriously. " Bettran arrived in Washington on Sunday morning after a 13-hour bus ride. Like many, he had a personal connection to the issue. His parents were once illegal immigrants but were able to take advantage of an amnesty in the 1980s. "Fortunately, they were able to become citizens during the last amnesty, but I know many people that weren't that lucky," said the American-born Bettran, adding that his brother was never able to gain legal status and had to leave the U.S. Lawmakers failed to agree in 2006 and 2007 when they last tried to overhaul the immigration system, and the political climate is even tougher now. Sens. Chuck Schumer and Lindsey Graham released an outline of a bill last week that calls for illegal immigrants who want to get on the path to legal status to admit they broke the law by entering the U.S., pay fines and back taxes, and perform community service. They also would be required to pass background checks and be proficient in English before working toward legal residency, required before becoming a citizen. Ben Jealous, president of the National Association for the Advancement of Colored People and a speaker at the rally, said the activists no doubt got the attention of lawmakers by converging on the mall "on the one Sunday Congress was in session." "I think you'll see a response in the following weeks," he said. Authorities in D.C. don't provide crowd estimates, but the mall was full of people for three blocks. People held signs with slogans such as, "You need us as much as we need you," and "No Human Being is Illegal." Many waved American flags, and a few also carried the banners of their countries of origin.